Can we have our Free-ball back? The above video is based on a 2009 video about the introduction of the Self-pass which even then was a revised edition. 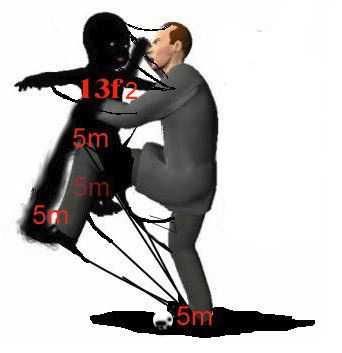 There have been many other changes to the Free Hit Rule made since the 2009 video for the Sydney area was produced. I have noted most of them within the above video. The video may need pausing from time to time to read text for which I have allowed insufficient reading time. The exceptions to that are the three frames of text I included at the end of it. I have reproduced those three frames below. My previous article https://martinzigzag.com/2018/08/24/circular-reasoning/ contains the unlettered explanation text following Rule clause 13.2.f so I have not repeated that in this article. I can’t explain that text: I believe it to be inexplicable because of the logical fallacy and circular argument used within it to justify its existence: the justifications provided don’t make any sense to me. The suggestions made above are not new (and to them can be added a restoration of an old Rule, the prohibiting of raising the ball into the circle with a hit in any phase of play – intention to do so being irrelevant) I have posted them many many times before, but I can only bear in mind, with hope, as I continue to do so, that these things take time. 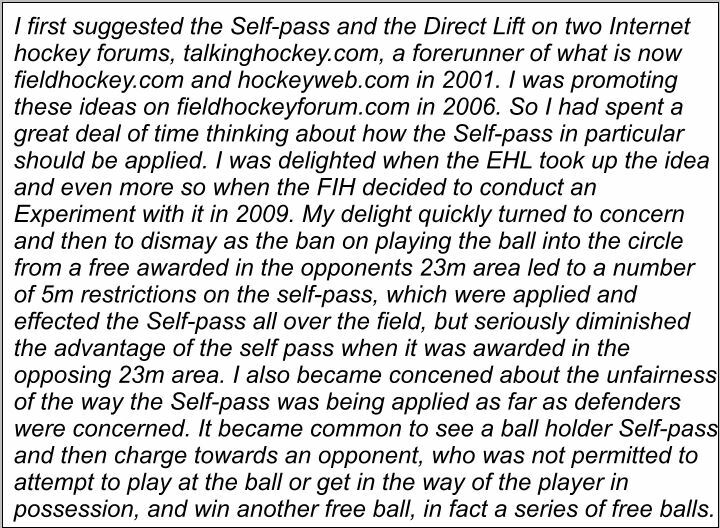 I was suggesting the Self-pass and Direct Lift in 2001; that is for more than six years before somebody with authority at the EHL took notice and acted. It took the FIH HRB another two years before they initialed the 2009 Experiment. 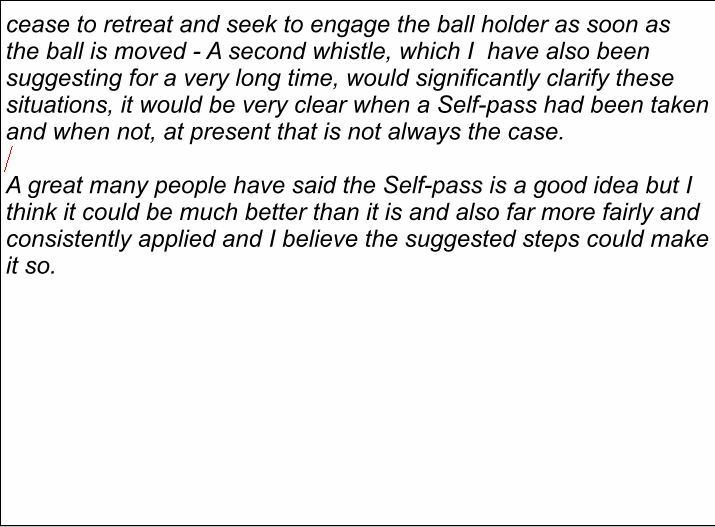 The Self-pass did not become accepted as Full FIH Rule until 2011, but too much time has been allowed to pass with an unsatisfactory state of Rule. The present complicated mess which is Rule 13.2 must be simplified, made workable, that is easy to apply and comply with, to produce hockey which is fair, sensible and attractive when a free ball is awarded. 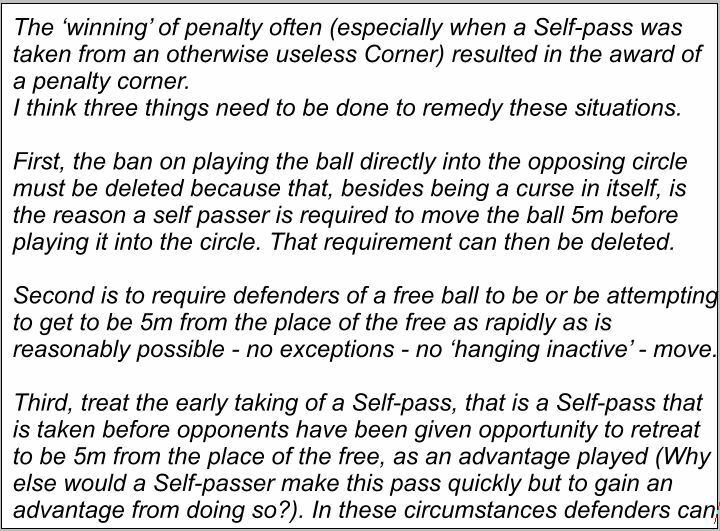 The reasons for awarding a free ball and other penalties could do with some revision too. Have I mentioned the Rules concerning the Dangerously Played Ball, the Ball-Body Contact Rule and the Obstruction Rule?